Sound The best equipment Ian has heard "in terms of pace or boogie"; "clearly adds some energy to the midrange, and I would be lying through my teeth if I said that it was either neutral or romantic." Features Flat-Cap power supply was a definite improvement to the CD3.5; all use the same size chassis, so they stack nicely and look clean together. Use Equipment uses Naim DIN connectors, but integrated also has provisions for non-Naim components. Value Ian wouldnt hesitate to call any of the Naim components he heard "a price-point leader." Would you like to see Britannia rule again? As the century draws to a close, it is probably fair to say that the past 50 years have not been kind to the once-mighty British Empire. England no longer possesses the worlds mightiest naval armada, and its expansive Commonwealth has dwindled down to a small group of islands. The loss of Hong Kong combined with the emergence of the EEC could have been the last nails in Britain's coffin, but the stiff, resilient Brits have rebounded with a vengeance in the past four years. Quite frankly, "its hip to be Brit again." (Sorry, but this Spice Girl wannabe just had to throw that in; now, would somebody please pass me some tea and strumpets?) Things are going so well in Britain at the moment that even the Queen Mother is dating again. A part of this renaissance has been the growth of electronic hardware, software, and communication companies throughout the British Isles, including a very strong group of high-end audio companies. Notwithstanding the recent financial difficulties of a number of British speaker manufacturers, music lovers in the United Kingdom are spoiled by a plethora of high-end audio products at every price range. We should only be so lucky on these shores! One thing that I have always admired about the British is that they insist on doing things their way (even if it has made them less than popular in parts of the world). Already in its third decade of operation, Naim Audio is at the forefront of the British hi-fi wave and clearly a group of people who believe that their musical-sounding green boxes are the pride of the Commonwealth. In contrast to the North American audio mentality that has always professed "bigger is better," Naims equipment is very much like the little engine that could. But dont let the slim-line design of the Nait 3, CD3.5, and NAT 03 fool you; these three entry-level components can compete with the best that the audio industry has to offer and at price points that most of us can afford. Have you ever listened to a highly touted piece of equipment in a dealers showroom, purchased it, and then taken it home only to discover that within the context of your own system it sounds horrible? Im guilty of this error, and based on the amount of used high-end gear for sale on eBay and in the audio classifieds, I know that I am not alone. Over the years, Ive had the chance to listen to a lot of Naim gear (both in stores and peoples homes), and I must admit that I find a great deal of merit in the Naim philosophy as far as system synergy is concerned. Naim dealers will almost always demonstrate a piece of Naim gear within the context of an all-Naim system (including the infamous five-pin DIN-terminated cables), and quite frankly, I applaud them for it. System synergy is very important, folks. In fact, I think that when selecting components (regardless of cost) for a system, you should try to keep mixing 'n' matching to a minimum. I'm willing to bet that in most cases this will save you time, money, and grief; and you will get the sound that you want. Another reason why I really like the Naim philosophy, is that you can take almost any component and upgrade it to another level of performance through a series of external power supplies (Flat-Cap, Hi-Cap, Super-Cap). Naim supplied me with a single Flat-Cap power supply, which I ended up using with the CD3.5, and the results proved to be rather interesting. Unpacking all four components proved to be a painless exercise, and what came in the box along with each component was a shock to even a well-seasoned (I'm a Texas dry-rub kinda guy) audiophile like myself. Brace yourself, ladies and gents. Each of the four components came with a fixed power cord (those interested in Naim's more expensive equipment should be thrilled to death to discover that they have removable power cords), a well-written manual, and a Naim interconnect terminated with the dreaded five-pin DIN connector. The manual clearly explains the operation of the specific component, but also how it can be upgraded through the use of one of the aforementioned power supplies. The diagrams are HUGE, and even a complete technophobe like my Mother could connect this system properly. All components are the same size: 17"W x 12"D x 2"H.
The Nait 3 integrated amp is actually derived from the entry-level NAC 92 preamplifier and 30Wpc NAP 90/3 power amplifier. The slim-line cabinet, which is made out of rather substantial sheets of aluminum, is quite heavy, and it inspired confidence right away. The grayish-green finish that has always been Naim's trademark looks very stylish in my opinion, and I was more than impressed with the overall level of fit and finish. It's almost impossible to mistake Naim gear for anything else, and I like the fact that the equipment has some personality. An illuminated Naim logo lets you know that the component is turned on. The Nait 3 (also available as the Nait 3R remote version) has five line-level inputs labeled aux, CD, tuner, tape, and VCR. The first input (aux) is a pair of gold-plated RCAs, which can serve two functions. If you decide to use a non-Naim CD player with the Nait 3, use this input. If you want to use a turntable with the Nait 3, your options are rather numerous. Naim offers four plug-in boards (one moving magnet and three moving coil) that can be fitted into the aux slot. A grounding post sits conveniently nearby. The remaining four inputs use Naim's five-pin locking DIN connectors. The sockets for tape and VCR carry record outputs as well (on pins 1 and 4). On the rear panel, Naim also includes covered sockets that can be uncovered and used to connect the Nait 3 to an external power supply and to a separate power amplifier should you decide to use the Nait 3 as a preamp sometime down the road. The front panel has an array of seven small touch-buttons for input selection, tape monitor, and the mute function. Each of the buttons is illuminated with a green LED when activated. Two large rubber-edged plastic knobs act as the volume and balance controls. An on/off toggle switch is located on the rear panel adjacent to the chassis-mounted fuse. The loudspeaker outputs are two pairs of shielded 4mm sockets spaced 3/4" apart to suit Naim's twin-pin right-angled plugs. Naim supplied me with a 15 pair of their NACA 5 speaker cables, and I found them to be an exercise in frustration. The cable itself is not the problem. The connectors, on the other hand, drove me crazy, and I was forced to push the Nait 3 as far back into my equipment rack as space would permit in order to plug in the connectors securely. The Nait's sockets will not accept spades, so forget about using third-party cables with that type of termination. My van den Hul Revolution speaker cables are terminated with expanding bananas, and I ended up using them for part of the review process. Internally, the Nait 3 is beautifully laid out. A rather substantial toroidal mains transformer sits at the front right, with the composite power supply and power-amp PCB situated right behind it. A second, double-sided PCB (preamp section) occupies most of the remaining floor space. Signal switching and muting are handled by encapsulated relays mounted behind the socket array. The volume pot is from Alps, the balance pot from Soundwell, and the 10,000uF power supply reservoir caps come from Aerovox. Overall, the construction and fit 'n' finish of the Nait 3 are exceptional. Great care is obviously taken at the factory to ensure that the finished product is flawless out of the box. The Flat-Cap is Naim's entry-level power supply and was designed to work with the Nait 3, CD3.5, and NAC 92 preamplifier. I removed the cover and discovered that most of the case is empty. Before you go running from the room, remember that Naim uses the same chassis for all of its entry-level equipment, and that you couldn't stack another component on top of the Flat-Cap if it were a different size. Inside, I found a rather large toroidal transformer along with rectifiers, capacitors and regulators. There is no monkey business going on here. The function of the external power supply in this case is to power the analog output stages of the CD3.5. The Flat-Cap connects to the CD3.5 after first pulling off a shorting plug from the rear of the player, and then wiring together the two boxes via an umbilical cord terminated with the DIN connectors. The umbilical is long enough that you can place each component on a different shelf without running out of cable. I experimented with both pieces resting on top of one another and separated by a few feet. If there was a difference, it was not substantial enough to notice. Besides, I like how the two components looked stacked together. Yeah, baby. Yeah! Until DAB becomes a household word and the quality (based on the unit I heard) improves dramatically, I'm not giving up on radio. My family has been in the radio business for more than 25 years, and I still enjoy listening to a good station late at night when most of the world has gone to sleep. If you know how to set up a tuner properly, it can sound pretty amazing, even in a lousy market like Toronto. If you are looking for a tuner that will allow you to locate weak signals, look someplace other than the NAT 03. If you are looking for a tuner that will allow you to flip constantly between wide and narrow bands, look someplace else. If you are looking for a tuner that has a memory function, look someplace else. If you are looking for a tuner that can lock down on a good signal like a vise grip, keep out overlapping signals, and sound phenomenal, then the NAT 03 is for you. The NAT 03 has one dial and an on/off switch on the rear panel. As you lock in a strong signal, the brightness of the display intensifies, and a stereo LED illuminates. The rear panel has a five-pin DIN output and a 75-ohm connection that you must use to connect the tuner to an antenna. That's all there is folks! Of the four pieces, it was the CD3.5 that I wanted to review the most. The CD3.5 uses a modified version of Philips' linear-tracking CDM12 mechanism, SAA7376 decoder, and TDA1305 converter. The DAC chip is a nominal 18-bit hybrid converter that uses a combination of bitstream and multibit technology. Naim uses the chip because of its low-level linearity and low overall distortion. Like the other three pieces in the series, the CD3.5 has a very large toroidal mains transformer situated in the right front corner which feeds a pair of 10,000uF reservoir capacitors, which in turn supply no less than 11 local IC voltage regulators. This is not a good CD player to leave lying around the swimming pool unsupervised (my safety tip for the summer). Most of the circuit can be found on a double-sided PCB that runs along the width of the cabinet at the very back. A second sub-board mounted behind the fascia is responsible for the control buttons and the LED display. The rear panel has an on/off switch, five-pin DIN output, DIN input for the external power supply, and, of course, no digital output. Naim has never included a digital output with any of its CD players and they sure didn't break with tradition this time around. The swing-out disc tray is just about the coolest thing in all of high-end audio, and I love how smoothly the it operates. 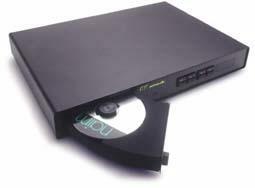 Naim supplies a small magnetic disc clamp that must be used or the CD player will not operate. The supplied remote is easy to use, and it does just about everything but make Scary Spice appear in a leopard-pattern bikini. Hey, you can't fault me for dreaming! From an operational standpoint, the CD3.5 starts and stops faster than any other CD player that Ive tried, and it was very easy to move in between tracks. If I have any criticism, it is that you can't go from the last track to the first just by hitting the fast-forward button. The CD3.5 proved to be a very good tracker, managing to play through some badly scratched discs without too many pops or ticks. To put the system through the ringer, I decided to leave it connected to the Meadowlark Kestrels and not turn it off for three months (totally serious about this). When I would leave for work in the morning, I left the tuner on CJRT 91.1 and turned the volume down. (Hey, who said I wasn't considerate of others!) I'm pleased to report that the system never burped, farted, or flaked out on me even once. Reliability should not be an issue with any of these pieces. While reviewing the all-Naim system, I made my notes regarding the sound of the system based on the overall sound of the entire system. We would all be using walkers by the time I finished detailing the specific sound of each component with each recording that I used. Loudspeakers  Meadowlark Kestrel and Hot Rod Shearwater. Amplifiers  Blue Circle BC6, Audio Analogue Puccini SE. Preamplifier  Copland CTA-301 MK II RC. Analog  Audiomeca Romance turntable, Benz-Micro H2O cartridge, Blue Circle BC23 phono stage, Wilson Benesch ACT .5 tonearm. Digital  Copland CDA-288K, Panasonic DVD-A310 DVD player, Rega Planet. Interconnects  Cardas Neutral Reference, van den Hul The First and The Second. Speaker cables  Cardas Cross, van den Hul Revolution. Power cords  Blue Circle BC61 and BC62, Cardas Hexlink. Accessories  Black Diamond Racing Cones, Chang ISO 6400 and ISO 3200 line filters, Magnum Dynalab Silver ribbon antenna, Vibrapods, petrified Krispy Kreme doughnuts placed on top of each speaker with the bite marks rotated to 2 o'clock. The first recording that I popped into the CD3.5 was the supremely cool John Coltrane and Johnny Hartman [Mobile Fidelity UDCD 740]. Johnny Hartman has one of those rare voices that could bring even Bill Goldberg to tears, and I was most impressed with the system's ability to breath life into a performance. The treble was a tad crisp-sounding at first, but nothing that would send anyone running for a bottle of Advil. The Naim gear clearly adds some energy to the midrange, and I would be lying through my teeth if I said that it was either neutral or romantic. Quite honestly, there were moments where the music just sounded real. There wasn't a lot of soundstage depth or width, but the gestalt factor was incredibly high. SoundStage! editor Marc Mickelson has been touting Tom Russell's The Man From God Knows Where [HighTone HCD8099] for close to three months, and I finally decided to yank out the old credit card and order it from Amazon. Marc may know nothing about booking hotel rooms (see our HI-FI 99 report from Chicago), but he knows great music when he hears it. Not only is this one of best albums that I have purchased in many months, but it sounds great as well. The Naim gear is the best that I've heard in terms of pace or boogie, and its ability to make listening to music an invigorating experience is second to none. The system as a whole does make everything sound more immediate and even louder (midrange energy), but not to the point where listening fatigue becomes a problem. In fact, I found myself fully immersed in music that I might otherwise find uninteresting. Shifting gears, I had to listen to Tori Amos and see how the Naim gear handled the female voice. Under the Pink [East/West CD 82567] got under my skin a long time ago, and I was really interested to see how it would sound in an all-Naim system. While not as seductive-sounding as the Art Audio Diavolo, the Nait 3 equated itself quite well. Tori sounded front and center, but the sound didn't have that degree of midrange sweetness and detail that makes the Diavolo such a great amplifier. The price difference between the two amplifiers is more than $4000, and I don't have a problem saying that the Diavolo is dramatically better overall and worth the additional expense. With the Kestrel, the Diavolo is the best tube amp that I have ever tried. The Nait 3 is a great partner for the little Meadowlarks and probably the best choice for people looking to build an affordable system around this speaker. And Justice For All [Elektra CD 60812] had more than enough pace, but the bass drum seemed to lack authority. Green Day's Nimrod [Reprise CDW 46794] has a lot of low-end energy, and it suffered a similar fate. Mike Dirnt's bass playing never lagged behind, but it didn't exactly hit me in the gut either. The sound quality of the NAT 03 FM tuner absolutely floored me. Using a very average antenna in a neighborhood surrounded by tall buildings, I found that classical and jazz stations became my primary source of late-night music throughout the review process, and I stayed up some nights until two or three in the morning because the fun I was having was enormous. Naim recommends using large multi-element outdoor antennas with the NAT 03, but I don't know how practical this is going to be for people living in apartments or condos. I'm currently experimenting with some smaller outdoor antennas, and I'll post a follow-up later if theres anything worthwhile to report. Some of you are probably wondering, "When the hell is he going to mention the Flat-Cap?" I did use the CD3.5 without the Flat-Cap for more than a month, and I still think that it is a great CD player without the external power supply. If I had to compare the CD3.5 (sans Flat-Cap) to my Copland CDA288K, I would have to rate it a dead heat. The Naim has better pace and handles dynamic shifts in the music better, whereas the Copland has a cleaner, more detailed midrange and it does a better job of reproducing space. When I use the CD3.5 with the Flat-Cap, it jumps all over the Copland and leaves it lying wounded in a dark alley. The midrange certainly becomes more transparent, and I could really hear more detail and subtleties in the recordings. The Flat-Cap is a worthwhile upgrade to the CD player, and its price is not so outrageous that it is unaffordable. The competition in the sub-$2000 category has become incredibly fierce of late, and a component really has to be something special to deserve a solid recommendation. On their own, each component in the Naim slim-line series is way above the norm from a performance/cost perspective, and I would not hesitate to call any of them a price-point leader. I want to single out the CD3.5 and the Nait 3 because they really do take the entry-level bar and throw it away with a fair degree of attitude. If you are interested in assembling an all-Naim system, the CD player and integrated amp are the perfect place to start. The NAT 03 FM tuner is the best sub-$2000 tuner that I have ever tried, and I've yet to try it in a good market with a strong outdoor antenna. The Flat-Cap will make a substantial difference to the sound of the CD player, and I suspect that it works well with the Nait 3 as well. God save the Queen! Prices: Nait 3, $1200 USD; CD3.5, $2150; NAT 03, $1250; Flat-Cap, $750.